Okay, to most people it's wierd looking, but at least it's not as bad as the Rideline. This vehcile is a great concept, but it's hard to live with. 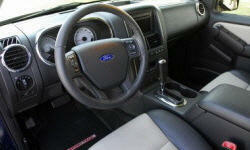 Why the 2008 Ford Explorer Sport Trac? For a winter climate like Alasak it's perfect - the three mode transfer case gives you all wheel drive, four wheel high lock, and low lock. I suspect it's geared low because it doesn't lack for power with the V6 around town. One the highway, it takes some proding to keep up to speed. Good visibility and everything is in easy reach. Controls are old-school, but that can be a good thing because they're intuitive and simple. The bed is small, but I've hauled 1000 pound loads to the landfill with no problem. The ride is steady but firm. The steering recieves lots of compliments in professional reviews and I'd agree - direct and connected to the front wheels. It's no sports car, but it's not at all truck like in it's handling. The steering is somewhat "high effort" at all speeds, no flicking it around in a parking lot with the palm off your hand. Matter of fact, no holding your coffee and parking one handed really. 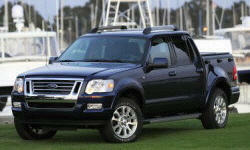 Why Not the 2008 Ford Explorer Sport Trac? So bad I can't drive it much more than the 4 miles to and from work. The front seats are so hard that the first couple times I drove it I couldn't figure out why my feet were so cold. Because the circulation below my knees was being cutoff. I have tried extra cushions for the seat bottom and I have found something that really helps, but on longer drives, combined with the firm ride - bring your Advil. Terrible. I've owned fullsize pickups and SUV so I know what to expect. I've never seen the average mpg display read over 15mpg for the six months I've owned it. The main reason I bought this was the combination AWD and 4WD transfer case, but it doesn't have a 2 wheel drive position like my Sierra did. Boy do I miss that, I averaged 20 mpg per tank. The ride is steady, but it's firm and larger bumps hit you through the seats hard. It is not truck like, which many people will appreciate - it's not floaty and doesn't jiggle constantly. There is nothing wrong with it, but it shows it's age. the top of the dashboard is made from 15 seperate pieces for example. Thankfully - no squeeks or rattles! The Sport-Trac is a smart design, and the right vechicle for most suburanites. Four real doors, great winter traction, a bed that will carry more than you think, and for someone like me who lives in Alaska - fits easily in the garage. You see alot of these around Anchorage. Some people like the looks, others don't. I like that's it's unique. It is however possibly the most uncomfortable vehicle I've ever owned, maybe even the most uncomfortable I've ever driven. Still, it's a good vehicle for many people so take a long test drive and see if it's okay for you.